“I’m Not Leaving You, Mama!” This is What Love Looks Like. 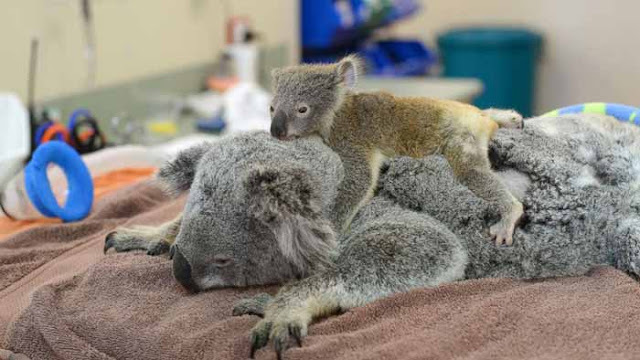 Lizzie and Phantom are currently recovering in an outdoor koala ward within the Australia Zoo Wildlife Hospital. They’re doing swimmingly; Phantom is both gaining weight and exploring his temporary habitat. And of course, mama and baby are sharing more adorable cuddles! After they were hit by a car, Lizzie and her joey, Phantom were welcomed into the Australia Zoo Wildlife Hospital. Six-month-old Phantom had escaped the accident unscathed. Lizzie, however, wasn’t looking so good, what with facial trauma and a collapsed lung. In order to survive, she needed to go under the surgeon’s knife. But this marsupial mama wasn’t alone during the life-saving procedure. Phantom accompanied her and clung to her as she received treatment. The vets let them be; Phantom was too young to be on his own, and splitting them would probably be too stressful for both koalas. Luckily for the duo, Lizzie’s prognosis is great: she is expected to make a full recovery. They will be released back into the wild once that happens. This story has a happy ending, but that is not the case for all koalas. Diseases, human activity, and climate change are picking away at their numbers. They are in need of our help. Will you join us?